Falcon redirects here. For other uses, see Falcon (disambiguation). The UH-144 Falcon is a versatile, multipurpose utility helicopter used by the UNSC Army. Manufactured by Misriah Armory, the Falcon is used for troop transport and deployment, as well as air-to-ground support. The primary utility helicopter within the United Nations Space Command's sizable fleet of vertical take-off and landing aircraft, the Falcon is one of the most popular transports within the Army, famed for its effective arsenal and speed. The UH-144 Falcon is a versatile, multipurpose utility helicopter. Unlike the nimble AV-14 Hornet or the swift AV-22 Sparrowhawk, the Falcon is exceptionally discrete, while remaining incredibly effective. The Falcon gained favor within the UNSC Army for proving to be an economical alternative to the larger Pelican dropships for short-range troop transportation and deployment. A pair of Falcons can easily and quickly transport a fully-equipped infantry squad faster than any previous helicopter, while providing overwhelming support fire, in most weather conditions. The Falcon's hull is sturdy, able to easily shrug off small arms fire and even certain heavier attacks. The frame of the Falcon is composed of a single elongated fuselage with a narrow, single-man cockpit and a large rear cabin, flanked by small wings. The pilot resides in the closed cockpit, while the crew have their choice of two gunner seats in extended buckets, two interior passenger seats, an aft bench, and a limited amount of standing room. Gunners secured themselves within the Falcon with a safety harness that hung from the ceiling. The Falcon is a vertical take-off and landing aircraft, equipped with a transverse rotor and engine pod on each wing. Although the rotors are powerful and capable of lifting a fully-loaded Falcon on their own, two dorsal-routed jet turbines provide most of the helicopter's thrust during forward flight. To take off, the Falcon's rotors are angled so that the rotor blades are horizontal. When the Falcon has reached the desired height, the pilot tilts the rotors forward so that the rotor blades are near vertical. In this mode, the wings provide some of the lift, and the rotors provide thrust as a propeller. The twin-turbine system gives the Falcon an extremely agile range of maneuverability. The Falcon's impressive maneuverability makes the helicopter an ideal aircraft for the tight confines of many battlefield environments, ranging from a narrow gorge, a dense forest, to even a skyscraper-laden cityscape. The Falcon is capable of reaching a maximum speed of 296 kilometers per hour (184 miles per hour). Distinguished by its unquestionably effective and relatively heavy weaponry, the Falcon is capable of being fitted with a wide variety of armaments. The primary armament of the Falcon is an M638 20mm autocannon, fixed in a nose turret below the pilot's main cabin. The autocannon provides effective suppressive fire when extracting or deploying personnel. Flanking the vehicle on both sides are modular weapon emplacements that vary depending on the Falcon variant. The emplacements are installed on flexible mount hardpoints on either side of the open cabin, selected at the discretion of the Falcon's crew. The UH-144A variant is armed with a pair of M460 Automatic Grenade Launchers, while the UH-144S variant sports standard M247H 12.7mm heavy machine guns. Both have proven incredibly effective against Covenant aircraft and providing point-to-point suppressive and attack fire on enemy ground emplacements and infantry. UH-144A: The "attack" variant of the Falcon, armed with two side-mounted M460 Automatic Grenade Launchers as secondary armament. UH-144S: The "support" variant of the Falcon, armed with two side-mounted M247H Heavy Machine Guns as secondary armament. The Falcon was introduced into service with the United Nations Space Command in 2497, though the helicopter only proved truly common with garrison forces of the UNSC Army on Inner Colony worlds. The Falcon was used during the Insurrection. Falcons were used throughout the Human-Covenant War, including during the Battle of Fumirole in April 2552. Falcons were used extensively during the Fall of Reach throughout the summer of 2552. Notably, the Falcons Kilo 33 and 34 transported NOBLE Team to Sword Base in an effort to end the Covenant assault on the facility. Numerous Falcons later participated in the Battle at Szurdok Ridge. Falcons would later participate in evacuation efforts and troop movement operations during the Siege of New Alexandria. One would carry SPARTAN-B312 to Caracalla Park to disable an SDV-class heavy corvette pinning down escaping civilian transport ships. Later during the siege, B312 piloted a Falcon to aid UNSC forces across the city and take down Covenant jammers. Several Falcons later saw action during the Battle of Installation 04, having survived the UNSC Pillar of Autumn's initial arrival on the ring in September 2552. These craft aided Fireteam Raven in various ground actions against the Covenant occupational forces. During their operation on Gao in 2553, the 717th Xeno-Materials Exploitation Battalion was equipped with two UH-144S Falcons, used for patrol as well as troop and supply transportation. When the Keepers of the One Freedom attacked the battalion, one of the Falcons was destroyed instantly and crashed into the Montero Vitality Center, while the second shrugged off the attack and fled towards the village of Wendosa. Over the course of the battalion's battle with the Keepers, the remaining Falcon provided troop transport and supply drops for the UNSC forces. However, the Falcon was eventually crashed in the Montero Jungle when the pilot was killed mid-flight days later. As of 2557, the Falcon remains in active service with the UNSC Army. A falcon is a bird of prey, in keeping with the UNSC's tradition of naming atmospheric vehicles after real animals with the exceptions of the Longsword, Shortsword, Broadsword, and Sabre, which are named after bladed weapons. The Falcon is nicknamed the "Warthog of the skies" by fans and Bungie employees. Superficially, the Falcon looks rather similar to the United States Marine Corps' V-22 Osprey tilt rotor. However, the Osprey's rotor blades tilt directly forward in flight. As seen in early concept art, it appears the Falcon would originally have possessed ducted air fans, like those of the AV-14 Hornet and D77-TC Pelican, rather than rotors. Much like UNSC aircraft in Halo Wars, Falcons that cannot be piloted have yellow windshields. In campaign, if one punches out the windows of these Falcons, they'll notice that there is no character inside piloting the Falcon. A Falcon avatar gear is one of the bonus items included with the Halo: Reach Limited and Legendary editions. Unlike most vehicles in Halo: Reach, the smoke from a badly damaged Falcon blocks a substantial portion of the screen, increasing the difficulty of flying a critically damaged aircraft. Unless the player jumps on top of a rotor hub, he or she cannot be killed by the Falcon's rotors. However, touching the rotor hub will kill the player instantly. It is possible to fly the Falcon in the first level. The player must hit the Falcon that Jun is not in with an overcharged plasma pistol shot. When it falls, the Falcon has a small chance of flipping on the ground and forcing the pilot out. Due to balancing purposes, the Falcon in multiplayer lacks the chin-mounted autocannon that is normally usable by the pilot. Elites can hijack Falcons in the campaign, disrupting the flow of the level and forcing the player to start it over again. Falcons are seen flying past UNSC Infinity in a screenshot from the Halo 4 level Reclaimer released during the E3 2012 Xbox Media Briefing. However, they do not appear in the final version of the game. Concept art produced for the game suggests the vehicle was intended for inclusion in the game, alongside the AV-14 Hornet. A Falcon passing over Kat during the Battle of Fumirole in Deliver Hope. A pair of Falcons glide into battle to support UNSC troopers in the Battle of Fumirole. 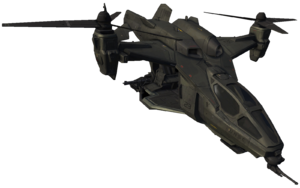 Early concept art for the Falcon for Halo: Reach suggests that it was originally a conventional helicopter, as opposed to the tiltrotor design found in the final game. Concept art of the UH-144 Falcon. A concept model of the Falcon. Concept art of the Falcon, side view. Concept art of the Falcon's rotors. Concept art of the Falcon's troop bay. Concept art of the Falcon's side-mounted weapons. A few of the original renders, note the chin gun. Views of the Falcon from Halo: Reach's development. Another view of the Falcon. Two UH-144 Falcons flying over a mountain. View from one of the Falcon's grenade launchers. A Spartan sitting in a Falcon. A Spartan firing one of the Falcon's grenade launchers. A rough model of the Falcon, used in background battles. Falcons (near UNSC Infinity) in an early build of Halo 4. Concept art of the Falcon for Halo 4. A UH-144 Falcon during the Insurrection in Halo Mythos. A downed Falcon in Halo: Fireteam Raven. Concept art of a UH-144 Falcon in a hanger for Halo: Outpost Discovery.